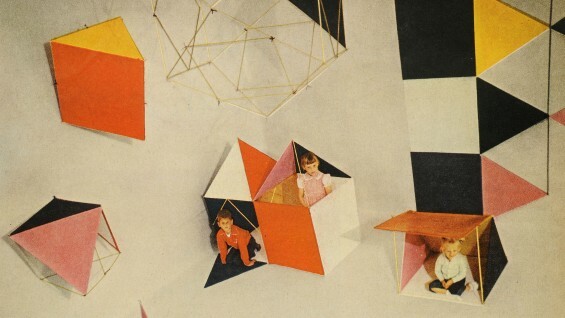 Detail: The Toy, designed by Charles and Ray Eames as it appeared in Life, July 16, 1951. Please join the School of Architecture in celebrating the launch of Architecture in Play: Intimations of Modernism in Architectural Toys, written by School of Architecture Associate Professor Tamar Zinguer. Created for children but designed by adults with considerable ingenuity and often pedagogical intentions, architectural toys have long offered a window on a much larger world. In Architecture in Play, Tamar Zinguer explores the two-hundred-year period over which such playthings have reflected changing attitudes toward form, structure, and permanence, echoing modernist experiments and stylistic inclinations in fascinating ways while also incorporating technological advances in their systems of construction. Zinguer’s history of these toys reveals broader social and economic trends from their respective periods. Focusing on four primary building materials (wood, stone, metal, and paper), Zinguer discusses four important construction sets: Friedrich Froebel’s Gifts (1836)--cubes, spheres, and cylinders that are gradually broken down to smaller geometrical parts; Anchor Stone Building Blocks (1877), comprising hundreds of miniature stone shapes that yield castles, forts, and churches; Meccano (1901) and Erector Set (1911), including small metal girders to construct bridges and skyscrapers mimetic of contemporary steel structures; and The Toy (1950) and House of Cards (1952), designed by Charles and Ray Eames, which are lightweight cardboard “kits of parts” based on methods of prefabrication. Used in the intimacy of the domestic environment, a setting that encouraged the eradication of formal habits and a reconceiving of visual orders, architectural toys ultimately intimated notions of the modern. Amply illustrated and engagingly written, this book sheds valuable light on this relationship between children’s toys and the deeper trends and ideas from which they sprung. Architecture in Play: Intimations of Modernism in Architectural Toys. Published by the University of Virginia Press, 2015. 256 pages; 8 x 9; 147 color and b&w illustrations. If you are unable to attend the event and would like to purchase this book, please click here. Free and open to the public. This event will be held in the Third Floor Lobby of the Foundation Building.